ABSTRACT: Modular coordinating piling system is innovative highly technological equipment, intended for construction of pile foundations with a flow-line production method. 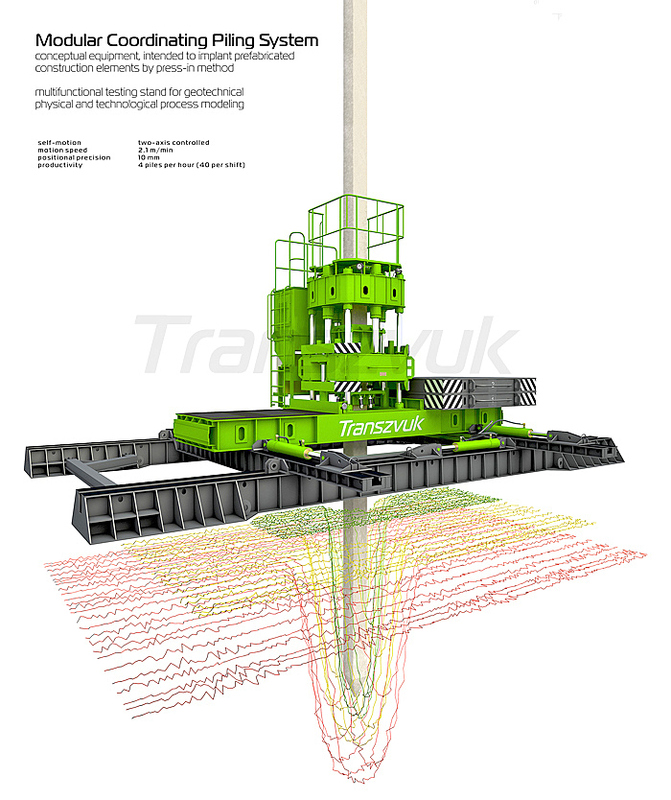 The piling system is equipped with the original piling machine and a modular coordinating skidding system. Environmentally friendly piling system operates with minimum noise, eliminates dynamic and vibration influence on the foundation bases and nearby existing buildings and structures. Piling machines are also applied for axial testing of piles during installation and after the “set-up” period. The continuous measurements of the current and final insertion force perform complete installation monitoring of every pile. Pile monitoring data confirmed by Static Load Testing is used to predict a static load capacity of every pile and provides the quality assurance of the foundation. Modular piling system equipped with hydraulic piling or sheet piling machine and modular coordinating skidding system is applied in civil engineering for static driving of precast concrete piles and sheet piles, steel pipes and standard articles of rolled metal profiles. Strategic technological advantages of the piling system are high productivity, precision and quality control. Piling system operates in the ordinary and complicated geotechnical conditions of urban and industrial areas. Hydraulic piling machine, with the side wedge clamping system is intended for construction of pile foundations and hydro engineering operations. Piling machines are applied for static pressing of precast concrete piles, sheet piles and construction elements with a cross-section range from 250 mm to 500 mm with insertion force up to 2000 kN without predrilling. Due to the side clamping system there is no limitation on the pile length. Sectional piles can be applied. Piling machines are highly-productive, reliable and easy to operate, do not require additional assembly after delivering on a construction site and are mounted immediately. Piling machines operate silently and eliminate dynamic or vibration influences on foundation bases. That makes them most favorable in the conditions of dense development, historical centers of the cities or nearby dilapidated and emergency state buildings. Piling can be carried out prior to any excavation, due to the possibility to install pile heads below ground level with the help of a metal ancillary pile. The ancillary pile can also be used for static leading and jetting of hard soils, such as high-silica sands. 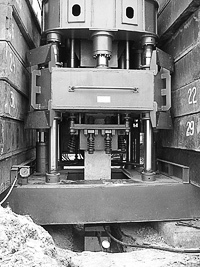 Anchorage is performed by metal counterweights mounted on a frame of the piling machine by the elevating crane. Pile sinking is carried out by vertical hydraulic cylinders with interception of a pile in automatic mode by the side clamping system. The clamping system allows to load the transversal section of a pile without loss of its stability and destruction. Required operating personnel are: operator and two slingers. The advanced technological feature of the piling machine is the possibility to control the current and final insertion force, perform the continuous installation monitoring of every pile. This information (digital installation data) confirmed with results of Static Load Test is used to predict the load carrying capacity of every pile of the foundation and opens facilities of interactive planning. The concept of the coordinating skidding system provides highly precise coordinated movements of the piling equipment on the construction site avoiding reanchoring of the piling machine. Skidding system is designed according to the modular principle. High productivity is provided by continuity of processes, saving time and costs of supplementary operations because of uninterrupted work of the equipment. Piling with the flowline method is provided by maximum combination of technological operations in time and space. Saving time, labor and materials provide substantial cost saving to the building contractor. Operating in the coordinating space exclude deviation of piles in the plan and opens the facilities of the automatic positioning system. Lateral movement velocity to the insertion point position is 2.1 m/min. Productivity of piling with the nominal insertion velocity of 1.87 m/min and the length of a pile 15 m is 40 piles during a prolonged (10 hours) working shift. Piling machines are also applied as the testing stand for the axial testing of piles during installation and after the “set-up” period, exclude installation of the anchor piles and usage of the heavy testing equipment. Continuous measurements of the current and final insertion force perform the complete installation monitoring of every pile. The complete installation data for every pile can be downloaded from the pressure indicator onto computer with the effective method of recording. Static Pile Load Test in conjunction with installation monitoring ensures that all piles are supporting required loads and are going to perform in the manner predicted in the design of the pile foundation. The use of these developments can help to reduce or eliminate static load tests, leading to consequent financial benefits for the client together with the quality assurance of the pile foundation. This is achieved by finding a correlation between the computerized installation records and known load test results. CONCLUSION: Modular piling system is intended for construction of pile foundations with a flow-line production method. Piling system is equipped with the original hydraulic piling machine and modular coordinating skidding system. Piling machines are applied for static driving of precast concrete piles with the insertion force up to 2000 kN. Environmentally friendly piling machines eliminate dynamic or vibration influence on a foundation bases and nearby existing buildings. The modular concept of the coordinating skidding system provides highly precise coordinated movements of the piling equipment. Continuous measurements of the current and final insertion force perform complete installation monitoring of every pile. Piling machines are also applied as for axial testing of piles. Installation measurements in conjunction with Static Pile Load Test, allow to predict load carrying capacity of every pile. This technological innovation provides the quality assurance and opens facilities of interactive planning. Technological advantages of the piling system are high productivity, precision and quality control. This state-of-the-art piling technology is constantly under development, improvement and advancement due to the requirements of modern methods of construction. This is a result of close cooperation between constructors, designers and practical engineers.